Trailer for My Entire High School Sinking Into the Sea, with voicework by Jason Schwartzman and Lena Dunham. 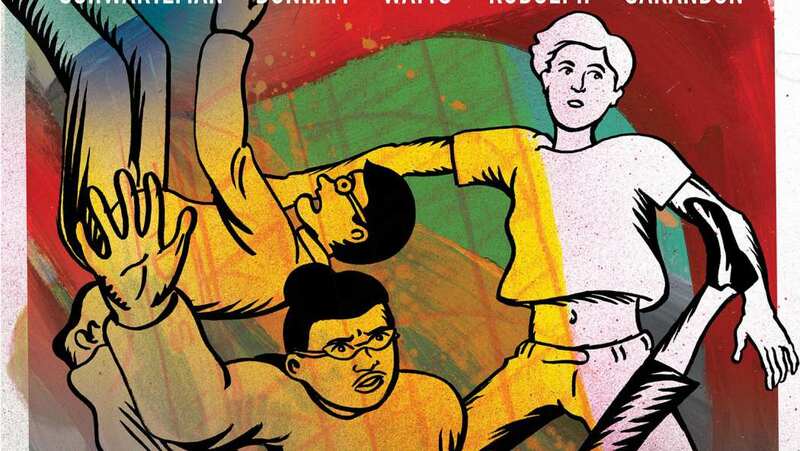 From acclaimed cartoonist Dash Shaw (New School) comes an audacious debut that is equal parts disaster cinema, high school comedy and blockbuster satire, told through a dream-like mixed media animation style that incorporates drawings, paintings and collage. Dash (Jason Schwartzman) and his best friend Assaf (Reggie Watts) are preparing for another year at Tides High School muckraking on behalf of their widely-distributed but little-read school newspaper, edited by their friend Verti (Maya Rudolph). But just when a blossoming relationship between Assaf and Verti threatens to destroy the boys' friendship, Dash learns of the administration's cover-up that puts all the students in danger. As disaster erupts and the friends race to escape through the roof of the school, they are joined by a popular know-it- all (Lena Dunham) and a lunch lady (Susan Sarandon) who is much more than meets the eye. But even as the film piles on brilliant details like a post-apocalyptic cult formed by jocks, video game homages, and an infectious synth soundtrack, it never loses sight of the characters at the heart of the story.